My media player of choice for years has been the Apple TV. I have a Gen 2, Gen 3, and a Gen 4 throughout the house. The combination of the Gen 2 & 3 along with iTunes has been a pretty solid combination for my household. I was pretty psyched for the Gen 4, because all it was missing was apps. I bought the 32GB Apple TV 4 right when it was released and I’ve just never been happy with it. The interface is crap, the remote is crap, and I constantly have to restart it to get it working properly again. I was really hoping that the tvOS update that came last month would have brought tremendous improvements, but it brought nothing that improved my user experience with it. At this point, I’m ready to try a different media player. One thing that has kept me tied to the Apple stuff was that all my media has been kept in iTunes. I’ve since setup a Plex server and moved all my media over to it and it’s been a pretty impressive experience. Being on a new media server allows me to look at other media players. So I’ve pre-ordered one of the new Roku Ultra‘s. 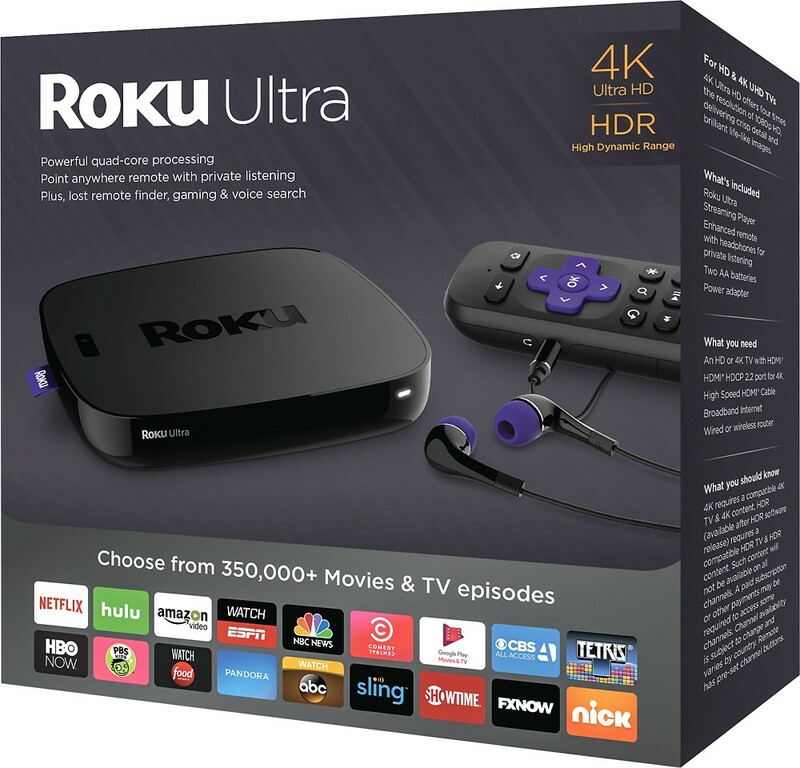 The new Roku’s officially release October 7th, so I won’t have it until early next week. I will report back once it’s setup with my first impressions. I learned this from a recent episode The Mike Tech Show. If you want an easy way to see all the applications that are installed instead of navigating the clusterf$ck that is the start menu. In order to preserve your IPTABLES rules upon reboot, install iptables-persistant. If you make any changes to the rules, run the following commands so you don’t lose them during a system reboot. In addition to the Linux computer I’m building, I also ordered another whole set of parts to replace my current main workstation. My current main rig runs Windows 8.1 (which I truly hate (but Classic Shell makes it tolerable)), and I’m ready to make the jump to Windows 10. My Windows 8 install has some odd issues that show up once in awhile, so I will not upgrade it. It must be a fresh install. And since I don’t want to wipe my current machine without a fully functional Windows 10 machine, a new build is in order. Below is the parts list that has been ordered. Should be a very decent machine for the total cost. I really, really wanted to go with the Core i7, but that makes for a huge jump in cost, even the Core i5 was more than I add right now. Also I thought about going with a Blu-Ray drive, but settled on a standard, inexpensice DVD-RW drive. I may make these upgrade down the line at some point. * Note: I have no cost associated with the Windows 10 Professional as I have licenses available to me as a Microsoft Partner with an active Action Pack subscription. I use a Windows computer in my day-to-day operations, but I’ve been using Linux on and off for many years. While I can’t switch completely to Linux, it’s time that I have a dedicated Linux workstation on my desk. Here is the hardware I’ve spec’d out for this build. It doesn’t need super mega high performance, or have ultimate graphics, so keep that in mind. My goal is a small footprint, and as inexpensive as possible while getting the most bang for my buck. Overall this seems like a pretty solid hardware selection. I can’t wait to get started! This process uses the command line to set a static IP address on Ubuntu Server 14.04. Note: If you do this process from an SSH session, you will lose connection when you enter the final command. But if you did everything correct, you simply need to establish a new session using the static IP address you assigned. This is a new post with basically the same instructions only not tied to a specific version. I will keep this post edited to reflect the current version. I’m starting with a fresh, fully updated server install of Ubuntu Server 14.04 64bit. At this point you will probably receive an error about missing dependencies. No worries, simply run the following. That command will install all the needed dependencies and finish installing the unifi video deb package. At this point, Unifi Video is installed and should be running. Open a web browser and point it to https://ipaddress:7443. Here is the list of components that I have ordered for this VM server build. You may notice that there are no drives as part of my order. I’m going to install the server OS on either a USB flash drive or a small SSD that I currently have. As for VM storage, I will do a test install using an HDD that I have laying around, but in the end I’m going to see if I can get it connected to storage on my Synology NAS, which has ~6TB of storage capacity. Going to be changing up my network a bit and want to start by adding a VM host server. I want to migrate my domain controller over to Windows Server 2012 R2 and I want to add a few more Linux servers to the mix. Currently my only physical server is a whitebox build running Server 2012. Besides being my current domain controller, I’m also running Hyper-V on it with a few Linux guests. It’s not the ideal setup, so that’s why I’m moving to an actual proper VM server. I can then run my DC as its own VM, and the Linux servers as their own VM’s. Parts have been ordered and some even starting to arrive. I will do another post shortly outlining the exact parts ordered and the host software I plan to use. As well as any issues I run in to along the way. I upgraded my main router as soon as it was announced. Went smooth. Love the new interface!